I felt this blog needed a bit of an upgrade with a few new features. I now have a proper About page, as well as a Recipe Index. I invite you to check them out using the links on the sidebar. When I was indexing all the recipes, I realized how little I post about salad, even though it is my staple lunch item when I'm at work. I find it easy to compose a salad, especially when the dressings are waiting in my little bar fridge at work. Throw together a few different types of leaves, a sliced apple and carrot, a few pecans, some feta and dried cranberries and you have a healthy and filling lunch. The ingredients vary slightly from day to day with different nuts, hard-boiled eggs, sometimes sliced cucumber, sometimes small broccoli florets. But the basic structure is always the same: leaves, veg, fruit and some kind of protein. Here are two of my favourite salad dressings. Both last a couple of weeks in my bar fridge and enable me to stay motivated to eat healthy at work. If you use the ratio method for this dressing, you can make as much or as little as you like. I usually make enough to fill two-thirds of a small glass jar. It's easy to shake and store. This makes a lot of dressing. You may wish to cut the recipe in half if you don't plan to eat salad every day for a week and a half. Process everything in a food processor. Modify the taste according to your preference. I find the goat cheese fairly acidic, so that's why I like to use the olive oil to contrast this. If you like it even more acidic, feel free to add some lemon juice. This dressing is fairly creamy. If it's too thick for you, you can add more yogurt or even some water to thin it out. If I'm getting tired of this dressing, I drain the excess liquid by placing it in a coffee filter in a sieve over a bowl. 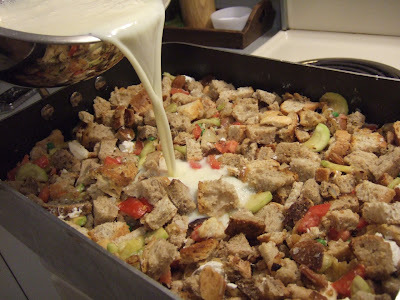 The resulting thick "yogurt cheese" is a perfect spread for bread or crackers. 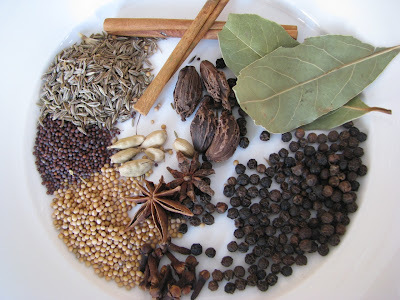 When I first started eating Indian curries, back when I was a student, I knew there was something special going on. The depths and layers of flavour in one bite were pretty astounding, and very different from the type of food I had been used to. When I tried to replicate these meals at home, the results were nowhere near as complex and delicious as from my favourite restaurants. Even those sub-par greasy Indian joints could make better curries than I could at home. 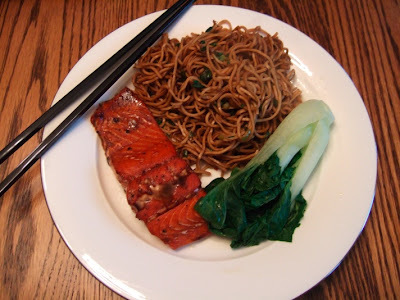 Then, about two years ago, I came across this post at TheKitchn, and my technique changed. In that article, the authors describe how to build layers of flavour, starting with spices, onions, ginger/garlic, tomatoes, then finally adding meat. It is no coincidence however, that the article was posted in their "Weekend Cooking" series. It takes a long time to cook, but thankfully, much of that time is inactive. 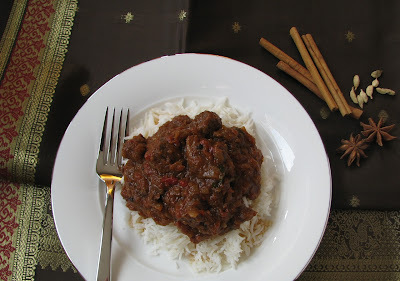 I recently made a version of this curry for our iPad announcement party - yes, we're big geeks! I began cooking at 11am and we ate at 6:30pm. Please don't be discouraged though: active cooking time was less than 1 hour! As a bonus, I was able to clean the house, do laundry, and prepare everything else for the meal in between attending to the curry. The only cleaning I like to do involves the kitchen, so I need to play a little game with myself for the remainder of the house. This game is akin to a parenting strategy I often hear: "Let me time you to see how fast you can put away your toys!" except for me it's "Can I dust the entire house before I have to stir the onions again?" Since the curry takes some effort and time, I've increased the recipe to yield a whole pot! This provides our small family of two 5 generous meals. The goal is always to freeze some and eat it later, but we love it so much we just eat it for 5 days in a row! 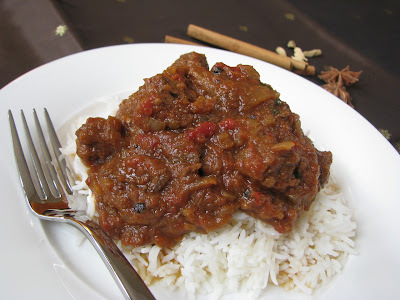 I also changed the recipe from the original to suit our preferred spices and heat levels. I've tried it with beef, bison, lamb and chicken. All worked well, although the red meats take much longer. Please don't be discouraged by the amount of spices included in the recipe. In fact, if you don't have these, use others. 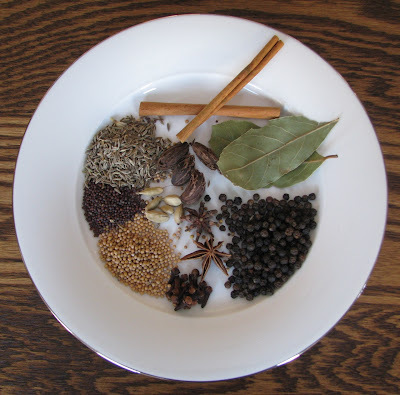 I have experimented with other combinations, and allspice and fennel would are nice here too. 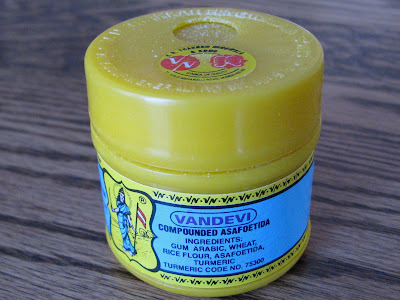 Amchur powder is another one I've used sometimes. Again, the time commitment here is largely non-active. Cleaning the house, or reading a book is a good complimentary activity. 1. 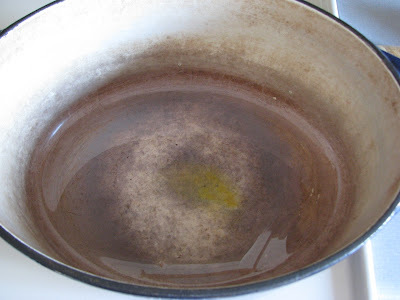 Heat the oil in a large pot on medium-high. I use an enamelled cast iron dutch oven. Sprinkle in the asafoetida, let it sizzle for a few seconds, then toss in all the whole spices. 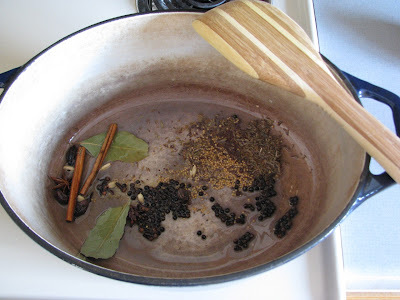 Fry the spices in the oil until you hear or see the mustard seeds and cumin start to pop, approximately 2 minutes. 2. 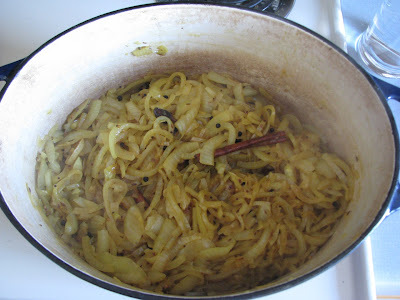 At this point, quickly add all the onions, a generous pinch of salt, along with the turmeric. Stir to coat the onions with the oil and spices. 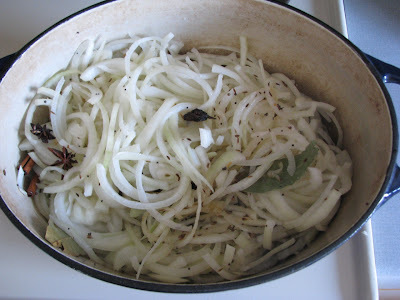 Let the onions saute on low heat for 30-45 minutes, scraping the bottom of the pot if some bits get stuck. You can add some water if you notice the onions sticking too much. Return to the pot every 15-20 minutes to stir the onions. 3. 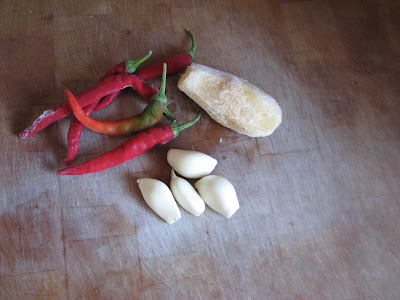 Add the chillies, garlic and ginger, along with the tomato products. Cook for another 30-45 minutes, stirring every 15-20 minutes. 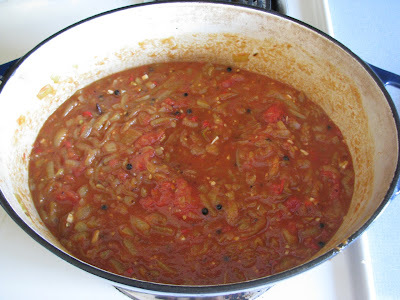 Taste the curry at this point and add more salt since the tomatoes often need it to enhance their flavour. The curry will be ready when the oil separates from the sauce. 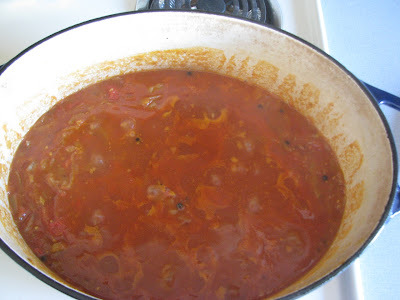 You will see it floating on top of the tomatoes and it will look a little darker than the remainder of the sauce. 4. 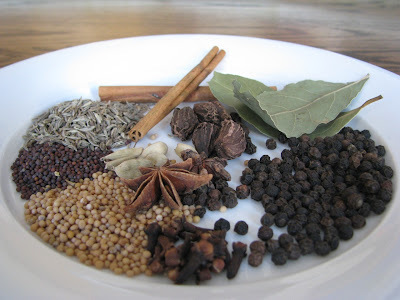 At this point, add in the garam masala and the cubed meat. For chicken, the curry will be ready in 20 minutes. For red meat, it sometimes takes another 2 hours, or even 3 hours, depending on the size of the cubes and quality of the cut. Stir the curry every 20-30 minutes. 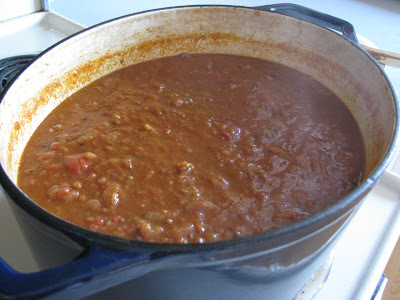 I usually start cooking the curry around lunchtime, then just let it simmer on low until the meat is done. If it's tender before dinner, I just reheat it when it's time to serve. 5. Serve over basmati rice, garnishing with cilantro and fresh chillies if you like. I haven't been feeling 100% lately, so I'm back to doing the elimination diet my naturopath gave me a few years ago. The idea is that you detox for about a month, eliminating common allergens in food, then reintroduce each eliminated item every few days to test its effect. I started just a few days before Halloween. So far, so good. It's easier now than it has been in the past, which I attribute mostly to increased awareness about gluten-free diets. I have a great recipe for gluten-free sandwich bread, and also for flat bread, so I'm not missing much of that. In terms of eating out, we've been to Las Palapas and Keo's since beginning the diet and they were both extremely accommodating. At Las Palapas I had enchiladas with a mole sauce, and at Keo's, a spicy thai curry with coconut milk. I definitely didn't feel deprived. This kind of eating challenges my cooking and creativity. I'm enjoying that part of it. The best compliment was my husband saying that it doesn't even feel like we're on any restrictive diet. Now, he does eat dairy and bread still, but mostly for breakfast and lunch. Dinners we eat together, so he does follow the elimination diet along with me for that meal. I'm enjoying making all kinds of new foods but most importantly, I'm happy that I feel healthy. A few weeks ago I went to the mini-farmer's market that has set up on 8th Street at Preston on Thursday mornings. I was surprised to see a vendor selling chanterelles. We chatted for a while and he told me they are from Northern Saskatchewan, picked by himself and a few friends. 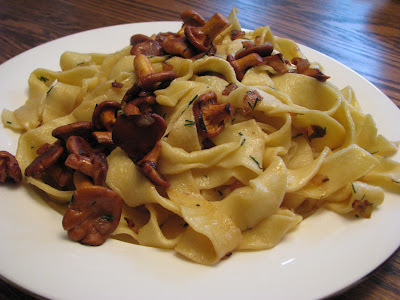 They looked like the mushrooms I knew from my visits to Poland - "kurki." I remember kurki in butter as being one of my favourite things to eat at my Grandparents' home. I remember my Grandmother standing at the stove stirring the mushrooms until they glistened. I remember her serving them with barley or just simply over good bread. I remember her delegating my sister and I to make the tea. I remember sitting at the large table scarfing down the best meals made by Grandma. I miss her a lot. 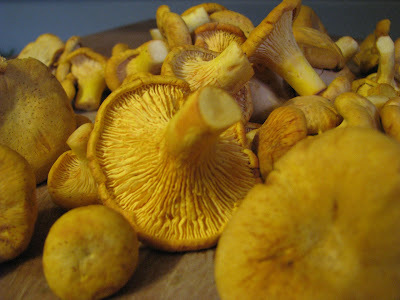 Well, I thought I might call my Mom to ask about these chanterelles and if they were really kurki. I bought a bag and before supper, called to confirm. 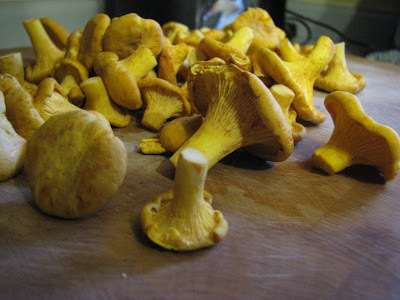 Yes, indeed, chanterelles are kurki. After a quick consultation on the best way to cook them, I started down memory lane. 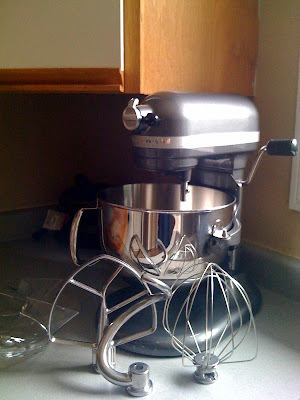 This thing mixes, whips and kneads beautifully. I have already made meringues, a pavlova, whole-wheat bread, two batches of brioche, coffee cake and it's only been three weeks! The mixer made quick work of the pasta dough, turning it silky smooth. I absolutely love my new toy. Thank you Mom and Dad! 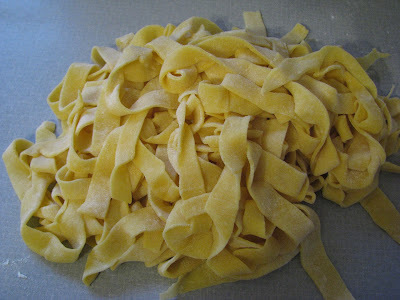 My first attempt at hand-rolling pasta was a disaster. I needed to call in reinforcements in the form of Ian's forearms. It's so hard to get the sheets thin enough. I used a recipe from Jamie Oliver's book, Cook with Jamie, and he recommends the thickness of the pasta sheets be somewhere between a beer coaster and a playing card. Eventually, we just settled on the beer coaster. We didn't have the proper flour (00 type), or the proper machinery, or even, the right amount of patience, but the meal ended up just perfect! Mmmm, these were just the flavours I remembered from my Grandparents' home. 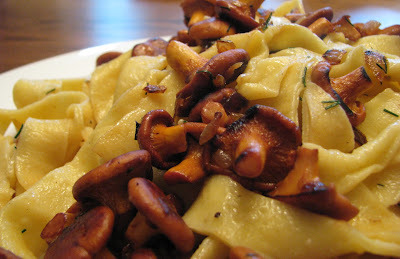 It's curious how this simple meal of mushrooms and pasta brought back so many emotions for me. I feel lucky to have had the opportunity to visit my Grandparents, help them in their garden, cook with Grandma in her tiny kitchen and eat these amazing fresh foods as a teenager. I feel blessed to be able to continue my Grandma's cooking. I feel a little sad that I'll never see Grandma again. But most of all, I feel happy to have kept many beautiful and joyful memories. I'm looking to try different kinds of cheeses, and my go-to place in Saskatoon is the Bulk Cheese Warehouse. Check out my conversation with the owner, Scott Bartlett, on foodtv.ca. 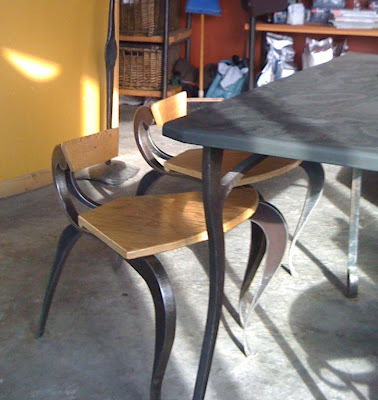 It was so interesting to hear him tell stories about cheese, business plans, the butcher shop and local food culture. Wow, that guy is a great storyteller. Thank you Scott! Check out my review of Caffe Sola on the Food Network Canada site. Here is a cool pic that didn't make it onto their website. The chairs are so interesting! If anyone knows what the source is for these, please let me know. Coming up on foodtv.ca: my profile of the BulkCheese Warehouse. 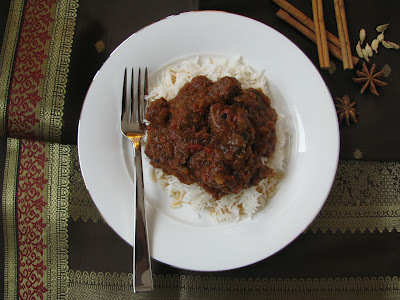 Coming up on birdseyechili: the best beef curry I know how to make...thus far. As those that know me just a little bit will attest, I loathe throwing away food. Maybe this comes from my thrifty upbringing, what with the second-hand clothing, price-comparing at the grocery store, and going without until I've saved enough to buy that one quality item. Now that I'm grown up, even the lowliest of fridge-dwellers get turned into something edible....I've been known to caramelize a pair of squishy onions and freeze them before going on vacation because I couldn't bear to compost them! Yes, I know. It's strange. I freeze end bits of dried and stale bread. That's right. I cut them into cubes and add them to a zip-top bag in the freezer. Dried baguettes, stale toast, hardened whole-wheat loves, you name it. Artisan bread just isn't as good the day after it's baked, so off to the cutting board, and into cubes it goes. Each end-piece ends up yielding about 1/2 to 1 cup. Slowly, I fill that zip-top bag. 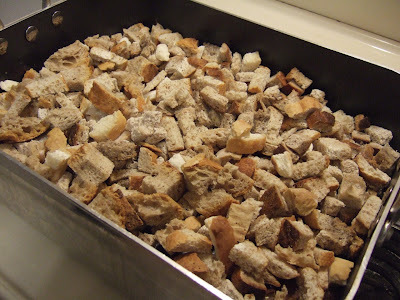 Then I use the cubed bread for croutons, stuffing, meatloaf, and breadcrumbs. As a result of this thriftiness gene, once every two weeks, we eat a refrigerator-clean-up soup, or stew, or curry, or casserole, or fried rice, or ... (you get the idea)... This practice allows me to use up all those left-over bits of herbs, vegetables, cheeses and meals that would otherwise make it to the garbage or compost bin. Of course, each "clean-up meal" provides us with a hearty dinner and plenty of left-overs for Ian to take to work for lunch. Food is used that would otherwise be composted and therefore, money saved. 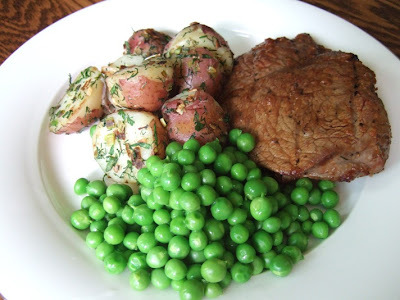 There is essentially one technique for each of these refrigerator-clean-up meals, but the ingredients change based on what needs to be "cleaned up". I have already gone the stew, curry and casserole route for dinner, so I decided it was time to tackle breakfast. And luckily, I had a bag of quality bread cubes to use. Of course, the point of this meal is to use what you have. 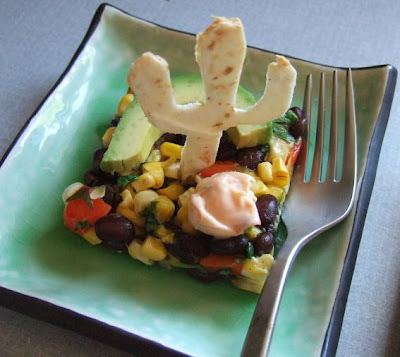 I image this would be yummy with left-over beans, mushrooms, basil, parsley, basically any kind of herb, roasted vegetables, corn, chilis, bits of left-over chicken or steak, fried tofu or tempeh. Use what's in your fridge! The combination below happens to be what I had in my fridge last night. Another added bonus is that you assemble everything the night before and the bread soaks up the egg and milk mixture overnight. In the morning, while you're having your first cup of coffee, just pop the entire thing into oven, and 40min later you have a delicious breakfast...to go with your second cup of coffee! 1. 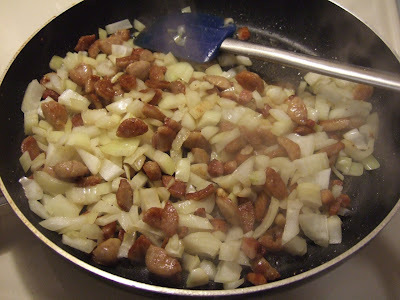 Fry bacon and sausage until crispy. 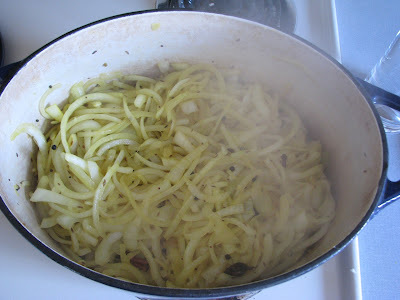 Add onions and saute until softened. 2. 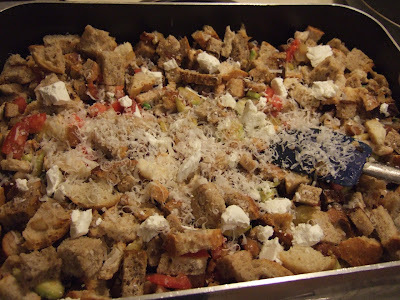 In the meantime, pour bread cubes into a large casserole dish and mix thoroughly so that all the different kinds are incorporated together. 3. 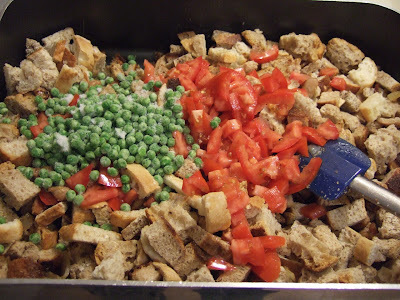 Once the bacon and onion mixture is cooked, add it to the bread along with tomato, peas, crumbled goat cheese, other cheeses. 4. Saute the zucchini rounds in the left-over bacon fat (mmm, bacon fat) and add it to the bread mixture. Mix thoroughly so everything is incorporated. 5. Whisk the eggs and milk, adding salt and pepper to taste. Pour over the bread. Tilt the pan to make sure the liquid is evenly dispersed, then cover and let sit in the fridge overnight. 6. When ready to bake, set the oven to 350 degrees and stir the mixture so the top gets moistened. 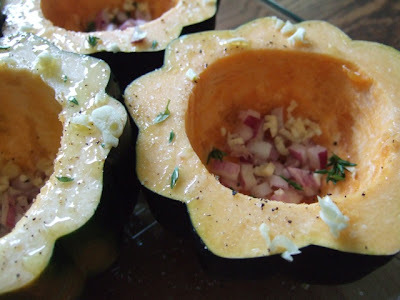 Top with more cheese, and bake 30-40 minutes. I didn't preheat the oven, and mine was ready in about 60 minutes. I imagine that the time varies depending on your casserole and how full it is - test it by spooning a little out of the middle and seeing if it's hot. The texture was like a savory french toast - crispy on the top and creamy/custard-like in the middle. As a bonus, we now have breakfast for the week! 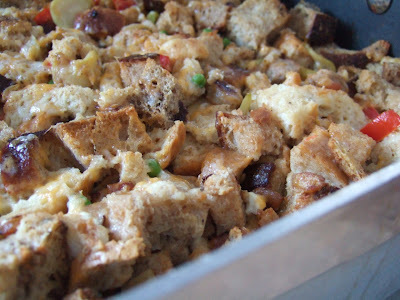 I'll portion the casserole into cubes and store individual pieces in glass containers ready to microwave in the mornings. Now go off to investigate what's lurking in the depths of your fridge and make a clean-up meal for yourself! Even though I don't usually cook from recipes, I am often inspired by recipes when making a new dish. As I've written before, I often check out my favourite cookbooks, blogs and chef's sites for the perfect blend of ingredients to make a dish. 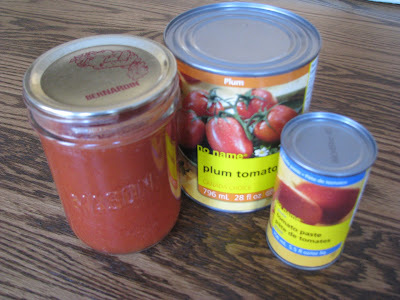 Then I modify these into the one recipe I will use. Earlier this week I made a Vietnamese tofu bun, complete with my own sauce, which brought me back to the days when I was a student in good old Toronto. Those were the days. Waking up late, subway to school, a little Vietnamese for lunch (toronto.com link) and a stroll through the ROM in the afternoon. I often picked up dinner ingredients from mom n' pop shops in the Bloor West Village (where I lived) and made some delicious eats for one. Evenings spent out with friends for drinks, a movie or a show. Or window-shopping. Oh, the shopping. That bun tasted like my favourite Vietnamese joint in Toronto, so much so that I'll have to make it again and write down the quantities so I can share with you all. 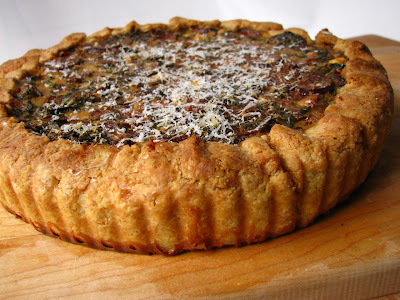 In the meantime, I'd like to share a recipe for a tart I made a couple of nights ago. Ian's verdict: "Delicious! It's like getting the vegetables for free!" And his follow-up tweet: "Even better than free. Most people would pay to take veggies away." Aww, I love my husband. 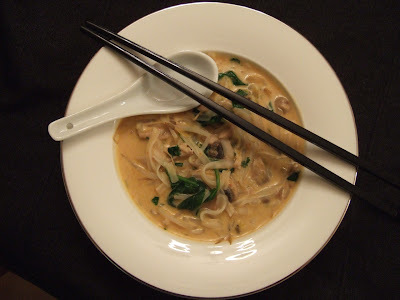 I created this recipe just as it was happening, and I'm happy to say, we enjoyed it so much, I will make it again. I also used a fancier setup for the photos, which took longer, but since the tart needs to rest before cutting, the timing worked out well. 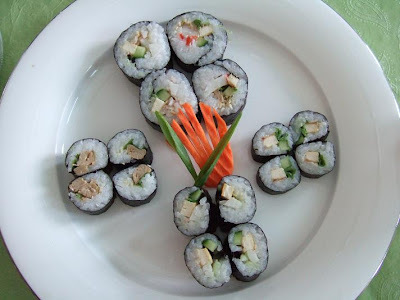 As always with my recipes, I invite you to use what you have. I made my own pastry, but if you wanted, you could use frozen pie shells as a short-cut (I did this my entire life until I recently bought a tart pan and now have the time to make my own!). I had left-over garlic butter (from garlic bread a few days before), so I used that to flavour the greens. But you could just use olive oil, or butter, or butter with a bit of chopped garlic. 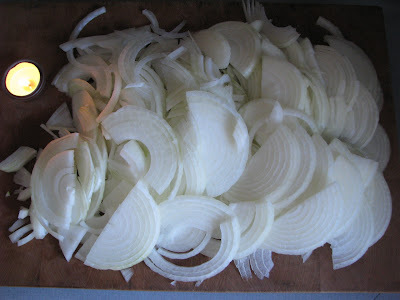 You can also replace the shallots with one medium red or white onion. If you don't have the same kind of cheeses we did, just use what you have - it'll work! I promise! Finally, we used Andouille sausage from Oyama Sausage at the Granville Island Public Market in Vancouver. You could use any kind of left-over meat: Italian sausage, roasted chicken, bit of left-over ham. 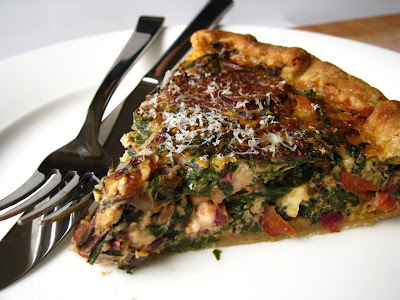 For a vegetarian version, replace the meat with more mushrooms, or even sauteed herbed tofu. Since this recipe comes together in separate parts, I recommend you season each part as you cook it. In fact, I like to season each ingredient as I add it. Just a little salt and pepper for each, then taste and modify if needed. That way, the flavours will build in layers and you will get nice depth of flavour throughout the entire dish. 1. For the pastry, mix flour and salt in a food processor (or by hand if you're not lazy like me). Add the chopped butter and pulse until it resembles bread crumbs. Add the egg and pulse. Add ice-water in 1 tbsp intervals until dough has enough "stick" to it to easily come together (I used 2 tbsp in my climate). 2. Dump it onto the counter and push it together into a disk. 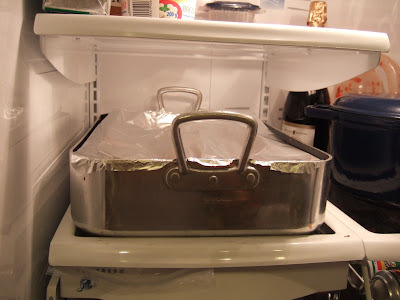 Cover with plastic wrap and refrigerate for 30-45 minutes. When ready to use, lightly flour a surface and roll into a circle (obviously!). 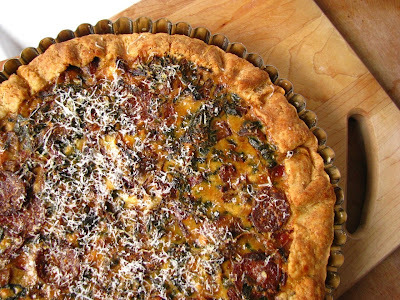 Gently lay into a tart or pie pan without stretching. Press into sides. Leave the excess for folding over, or cut off excess. 3. 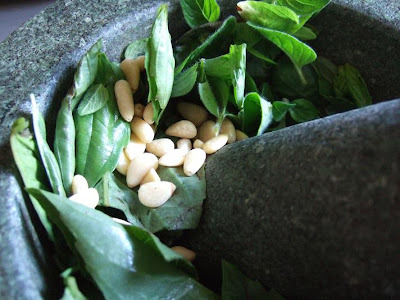 While the pastry dough is resting, clean the greens, dry and chop them. I chopped the chard into roughly inch-long pieces, and the been greens into ribbons. But you decide how you like it. Also, slice shallots and mushrooms thinly. 4. In a medium saute pan on medium heat, melt a tsp of butter and saute chard with a bit of salt, then set aside. Then saute beet greens (add bit of salt) and set aside. More butter or oil, add shallots for 1 min, then add mushrooms, and season with salt and pepper. Saute until most of the moisture has evaporated out of the mushrooms. Add sausage and heat through for another 2-3 minutes. 5. 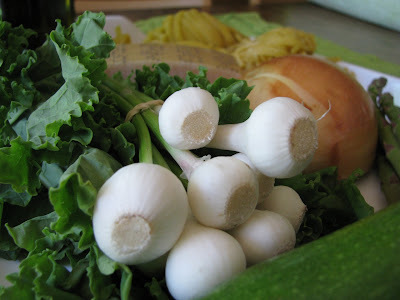 Mix greens and mushroom mixture in a bowl and set into fridge to cool a bit. In the meantime, beat the eggs and remaining ingredients in a medium bowl, adding salt and pepper to taste. 6. Roll out tart and lay into pan. 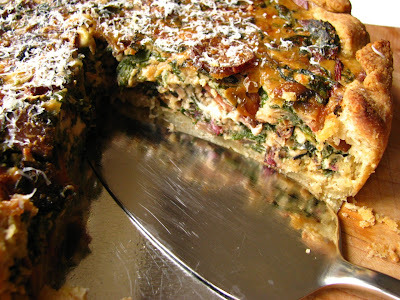 When tart is ready, combine the greens and egg mixtures. 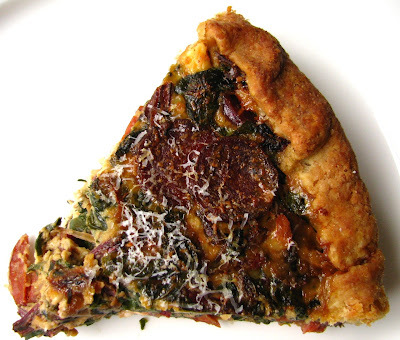 Place solids into tart, distributed evenly. Pour liquids over top, and jiggle the tart to distribute liquids. Grate a bit of parmesan over the top. 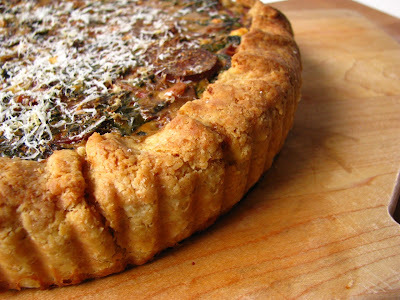 If you have left-over pastry edges, fold them down on top of the tart. 7. Put a sheet pan or some foil under the tart pan to catch drippings. Bake for 40-50 minutes until pastry is golden brown. Let the tart rest for 10 minutes before cutting. Serve generous pieces with salad or by themselves. 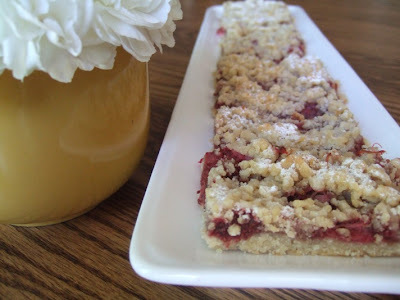 This made a great dinner, but I could also see this as an awesome brunch or lunch item too! Enjoy! 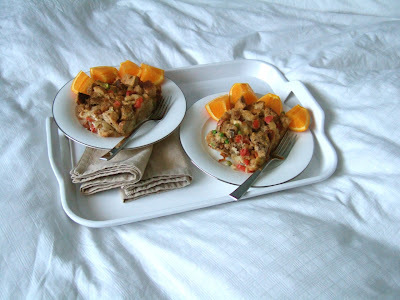 When zipping out the door in the mornings at 6:30 or 7 a.m., we tend to forget about breakfast. I know it's unhealthy, but it's just the reality of a busy life. To combat that, every few weeks for the last year I have made two loaves and a pile of muffins of some sort of breakfast-type healthy breads. We portion them off into tupperware and zip-top bags and freeze individual portions. 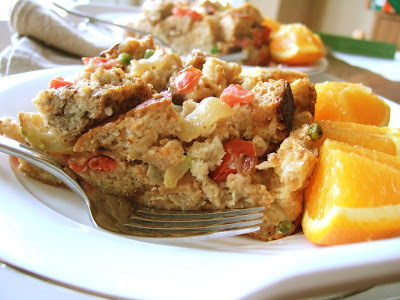 This way, we can grab one from the freezer the night before to defrost, and voila - healthy breakfast on the go! Some weeks the flavours are zucchini-carrot, other weeks it's banana-walnut-cranberry. I basically use what I have and strive to make this a healthy quick meal in one. 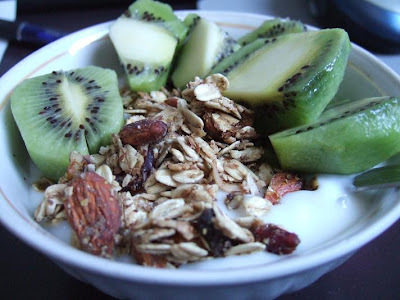 I add plenty of nuts and seeds, and always use fresh veggies or fruit. There is often only 1/2 cup sugar, and 1/3 cup oil in the whole batter! (that's for two breads and a dozen muffins). 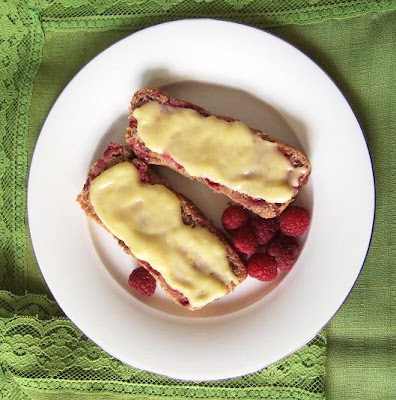 The rest of the sweetness comes from honey, maple syrup, applesauce or cranberries and the breads are moist as a result of prune puree, yogurt or applesauce. But lately I've become tired of eating these breads. Even though the flavours vary, the texture and shape remain the same and have started to bore me. 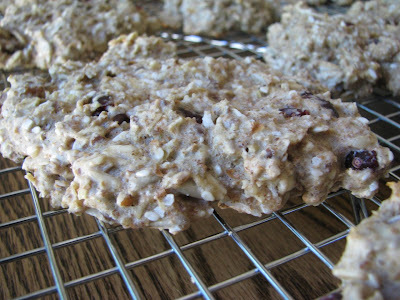 So last week, I decided to modify my recipe into a seedy and dense breakfast cookie. That's right, a cookie for breakfast. I was quite surprised at how well these turned out and will most definitely make them again. In fact, these would be perfect as road trip snacks (which we had on our recent trip to Vancouver! 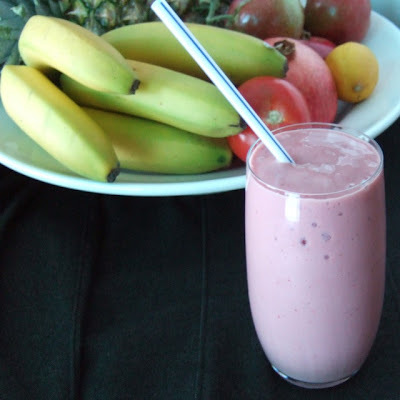 ), as power boosts during a hike or as a mid-morning snack to hold you over if you have a late lunch. I'm also going to try spreading the batter into a square pan and cutting power-bar-like shapes as an easier and faster alternative to placing and spacing cookies. Preheat oven to 350F/175 C. Line a cookie sheet with a silicon mat or coat with butter. 1. Put on 1 cup of water to boil and place oats in a small cereal bowl. When water is boiling, pour over oats and cover with a plate. Let stand until you're ready for them, 5-10 min. 2. In a medium bowl, stir all dry ingredients together. 3. In a large bowl, cream butter and sugar. 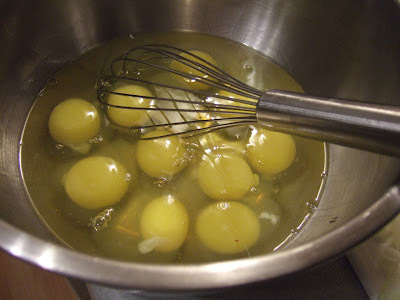 Add eggs one at a time, and incorporate with a whisk. Stir in vanilla and milk. 4. 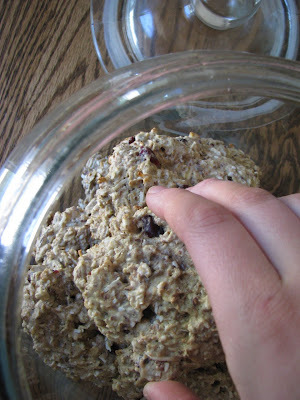 Drain any excess water from oats. 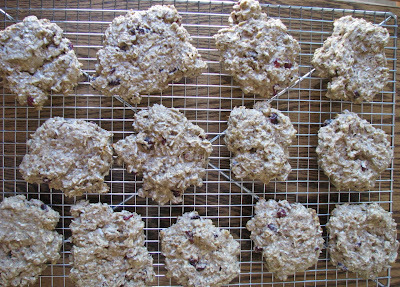 Stir in dry ingredients into wet, alternating with adding oats. Be sure that you stir quickly after each addition of the hot oats so eggs don't cook. 5. Stir in the mix-ins, making any substitutions you like, but keep the entire quantity the same (just over 2 cups). Spoon onto cookie sheet, flatten, and bake for 12-15 minutes until the tops brown slightly. I wanted substantial cookies, so I made 7 large cookies in each batch for a total of 14 cookies. If you make normal sized ones, you could probably get 20 cookies out of this batter. On Saturday mornings, Ian and I like to go to the Saskatoon Farmer's Market. We have supported it since we arrived in Saskatoon. Then, it was located in a street in front of City Hall, but now it has its own building and market square on the riverfront. Members must make, bake or grow whatever they are selling. It is not permitted to buy and re-sell at the market. Each individual...must be personally present to operate their stall. At the Saskatoon Farmer's Market, I can talk to Clifford, the flour guy, about his ultra-clean grains and to Wally, the urban gardener, about his micro-greens. I'm able to ask re-planting advice for the herbs I bought from Helga and am instructed on the benefits of local honey to help curb allergies from the Bee Lady. 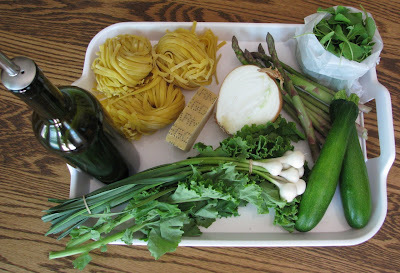 The first Saturday of summer (yesterday) started off with a trip to the market and a decision to make 'green' pasta. 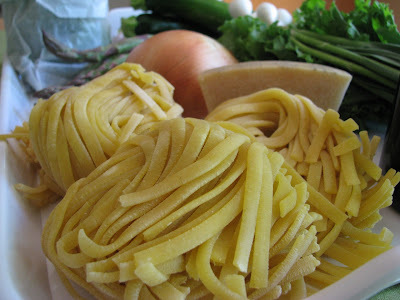 That is, pasta made with green, local, seasonal, ingredients. 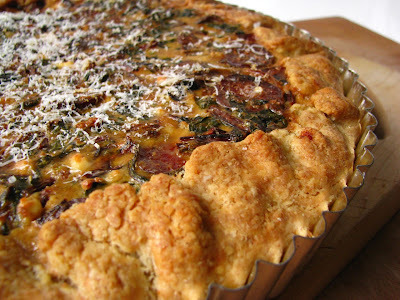 It mostly worked: the kale, zucchini and lemon were from Dad's, and the salt, pepper, onion, cheese and oil were imported. But the rest were all bought from the producers at the market. 1. Boil water for the pasta. Generously salt the water. Meanwhile, prepare all the vegetables. 2. Heat as large an amount of olive oil as you like in a large pan (2-3 tbsp) on med-high heat. Saute the onion and garlic, seasoned with salt and pepper, until translucent. Add zucchini and cook long enough so it gains some colour. 3. Meanwhile, remove the kale from the stock and roughly chop into small-ish pieces. Add asparagus, kale and thyme leaves to the pan. 4. 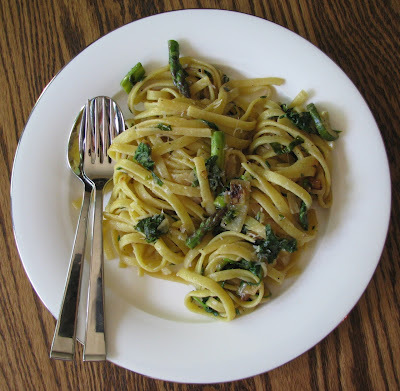 Drain pasta in a colander when ready and drizzle with olive oil. 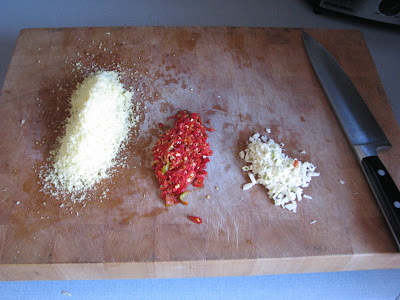 Season with salt and pepper and grated parmesan. 5. 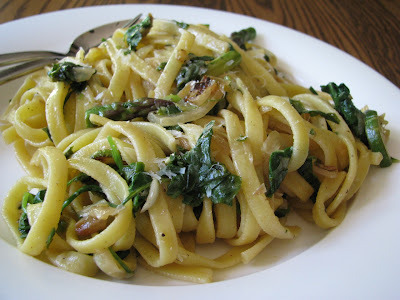 Combine pasta with sauteed vegetables, lemon juice and zest and arugula. The arugula will wilt from the residual heat of the pasta and pan. If you like, add more oil and parmesan for a creamier texture. Serves 3 very hungry people as a main course, or 5 as a side dish.